State Rep. Neil Abramson is introducing a bill that expands tax rebates for professionals who will work in the planned BioDistrict and purchase a blighted or abandoned property anywhere in the city. State Rep. Neil Abramson is attempting once again to merge blight reduction with bioscience-related economic development, but his proposal leaves some Mid-City residents wondering what’s in it for them. 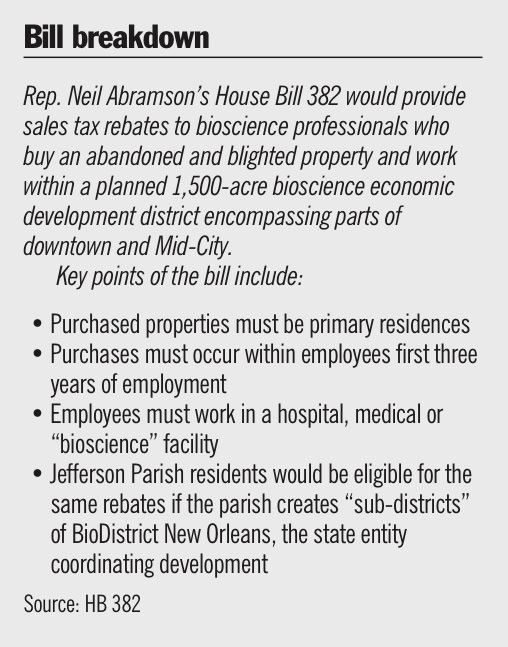 House Bill 382 would provide sales-and-use tax rebates to “any legitimate employee of a hospital, medical or bioscience facility” who buys a blighted or abandoned property and works within a planned bioscience economic development district encompassing parts of downtown and Mid-City. Eligible purchases must occur within three years of an employee’s start date. Abramson filed a similar bill in 2010, but it died in committee. A key difference in the latest incarnation is the expansion of eligible purchases throughout the city, as opposed to confining it to properties within the district. That’s repugnant to Mid-City Neighborhood Association Board Chairman Miles Trapolin, whose organization is already frustrated with residential demolitions taking place to make way for the 1,500-acre district. BioDistrict New Orleans CEO James McNamara said demolitions have occurred only in connection with development of the new LSU and VA hospitals, and no additional demolition is planned. McNamara said he does not know how many acres have been demolished. The bill offers the neighborhood nothing in return for roughly 70 acres of homes that have already been razed, Trapolin said. “My real motivation this time is to push the topic. I think it’s a great idea. I realize it’s not going to happen overnight,” he said. Abramson said he hasn’t held substantive discussions on the concept with Mayor Mitch Landrieu’s administration, though he acknowledged that the mayor’s support is necessary because of potential impacts on city revenue. The bill does not appear to be high on the administration’s priority list. Landrieu spokesman Ryan Berni did not offer a position, noting only that the bill was not filed on behalf of the administration. If passed, the new law would also provide rebates on materials and services purchased in Jefferson Parish for use on homes in New Orleans. 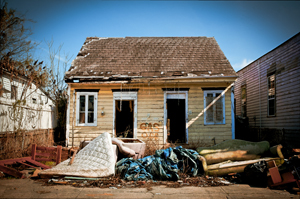 Rebates on derelict homes in Jefferson Parish would be available if parish government establishes “subdistricts” ofBioDistrict New Orleans, the state-created entity that is coordinating development.